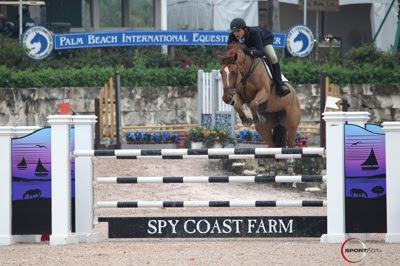 Photo Credit: Andres Rodriguez and Oreade Des Dames won the $6,000 Spy Coast Farm 1.40m Speed Challenge during week 5 at the 2011 FTI Winter Equestrian Festival. Photo © Sportfot, Official Sport Photographer of the FTI Winter Equestrian Festival, www.sportfot.com. Wellington, FL - February 11, 2011 - The fifth week of competition at the 2011 FTI Winter Equestrian Festival continued on Friday with the $6,000 Spy Coast Farm 1.40m Speed Challenge, held in the International Arena of the Palm Beach International Equestrian Center. Despite a rainy day, the riders came out in full force for the class, showing over a course set by Alan Wade of Co. Tipperary, Ireland. Out of 50 starters, Venezuela's Andres Rodriguez piloted Oreade Des Dames to victory with the fastest of 12 clear rounds. Rodriguez and Oreade Des Dames went right in the middle of the pack in today's speed class with eight clear rounds already ahead of them and three more to follow. Rodriguez knew he had to be fast to win and he did just that. After leaving out a stride in between fences two and three, Rodriguez knew he had the time in hand and was able to safely navigate the rest of the course without fault. The pair's time of 63.571 seconds held on for the win. Rodriguez explained, "I think that I really had the time from two to three. My trainer, Rodrigo Pessoa, advised me from outside the ring that I was already fast enough and could take a little time and do the five coming to the wall. I owe him a little bit for that one because I was still going to go for the four. I think he was right; I already had the time because of my turn to number three." Finishing in second place, Reed Kessler and Flight finished the course with no faults in 64.023 seconds. Third place was awarded to Kate Bomgaars and her horse Online for their clear round in 65.244 seconds. Brianne Goutal and Cloverleaf Farm's Mon Gamin placed fourth in 65.425 seconds, and Ben Maher rode Quainton Quirifino Z into fifth place with a clear round in 66.065 seconds. Co-owned by Andres Rodriguez and Andres Olivares, Oreade Des Dames is a nine-year-old Selle Francais mare by Kannan x Hurlevent. Today's victory was the mare's second of the week after she also won a 1.35m class yesterday. "She is really good; she just came here at the end of the year and I expect her to win many classes this year," Rodriguez stated. "She won a class yesterday and then again today, and our hopes are really high for her." Rodriguez has had Oreade Des Dames since the end of November and has been showing the mare in smaller classes to get to know her. "This week I decided to start trying to compete and the two classes she went in she won, so I am really happy," he smiled. "She is really careful and she really tries to win every time she goes in the ring. I am very proud of her." Now based in Wellington after riding in Belgium with Rodrigo Pessoa from 2001 to 2005, Rodriguez plans to do mostly speed classes with Oreade Des Dames and then hopes to show the mare in some small grand prix classes by mid-summer. Although based in Florida, the rider spends most of the year traveling and has plans to compete in Europe this summer. He will then return to North America to ride in Calgary at Spruce Meadows and then back in the United States for the indoor circuit this fall. The 2011 FTI Winter Equestrian Festival will continue tomorrow with the $150,000 FEI World Cup Grand Prix, presented by Spy Coast Farm, at 7 p.m. in the International Arena.